In an article published by 680 News on October 6, 2017, Mayor Tory announced Councillor Joe Mihevc as Toronto's new poverty advocate, and myself as one of four Deputy Mayors, each representing a designated part of the city. I am both honoured and humbled by the appointment, and will continue to represent Ward 18 in addition to my new responsibilities. City Councillor Ana Bailao has been appointed the city’s deputy mayor for South Toronto. 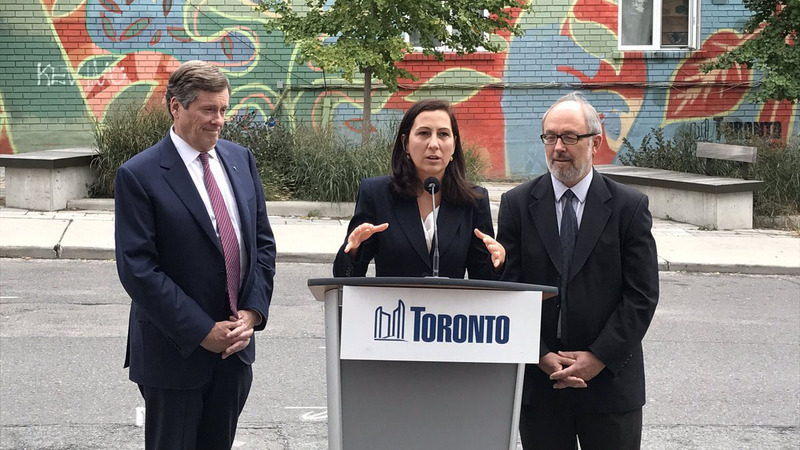 Standing in front of the Dundas West mural on Sheridan Avenue at Dundas Street West, Mayor John Tory made the announcement on Friday, calling her one of the hardest working people in council. “She’s advocated on many things but none more so effectively than on housing,” Tory explained. When Tory became mayor in 2014 he bucked tradition and appointed four deputy mayors in an effort to to ensure geographical representation in his inner circle. Long-time city councillor Pam McConnell was appointed deputy mayor for Toronto and East York district – a position she held until her death in July. “I’m humbled by the nomination but I really know that I have big shoes to fill. I really want to take this opportunity to once again recognize the work that my dear collogue and friend Pam McConnell has done for Torontonians, for her residents in her ward but also what she taught so many of us,” she said. Bailao came to Canada from Portugal at the age of 15 and moved into the neighbourhood she now represents. She was first elected to city council in 2010 and sits on several board and agencies including the Executive Committee and the Affordable Housing Committee. Tory also announced that Coun. Joe Mihevc would become the city’s new poverty reduction advocate – a position also previously held by McConnell.